The Centers for Medicare & Medicaid Services (CMS) is required to remove Social Security Numbers (SSNs) from all Medicare cards by April 2019. A new, unique Medicare Number will replace the SSN-based Health Insurance Claim Number (HICN) on each new Medicare card. 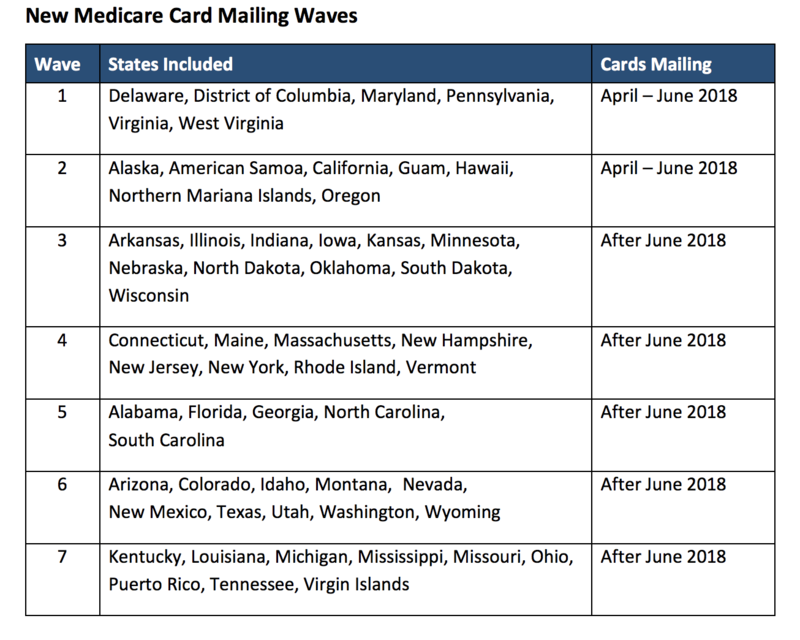 Starting April 2018, CMS will begin mailing new Medicare cards to all people with Medicare on a flow basis by geographic location and other factors. These mailings will follow the sequence outlined below. Additional details on timing will be available as the mailings progress. Starting in April 2018, people with Medicare will be able to check the status of card mailings in their area on Medicare.gov.